Githan Coopoo is a queer Cape Town designer who infuses his work with ceramics into jewelry-making. He largely pulls from his Desi descent, building upon the metalwork of his grandparents and lifting inspiration from his parents' relationship. This, in turn, makes for a practice that's deeply personal, while also speaking to Coopoo's own experience navigating the world as a queer South African. On Instagram, Coopoo describes himself as a "curator," using "clothing and clay as universal mediums to queer the archive and unpack the performative nature of dress." And his new collection, titled Byzantine, accomplishes just that, with handmade ceramic jewelry that reflects on history with total disregard to traditional gender roles. Performance artist and poet Alok Vaid-Menon caught up with Coopoo to learn more about the new collection and accompanying campaign, below. Alok Vaid-Menon: How did you come into making ceramic art and jewelry? Why these forms? Githan Coopoo: I choose to work exclusively with clay as I find it to be a medium that is both uncomplicated and universally timeless. Using clay gave the earrings the capacity to be fragile and sensitive — I wanted to create an object that was beautiful because it was sensitive to the world. One would keep it safe and value it because of its very human sensibility to crack, break or be damaged. The Byzantine collection looks at found objects and notions of the broken, imperfect and fallible. I wanted to create a collection that looked like they had come from societies long gone, that had been worn and damaged, but still retained an uncomplicated beauty. I make everything by hand myself, and usually only once, so each piece is truly unique. Can you tell us more about your creative process from ideation to implementation? Where do you draw your inspiration from and where do you do your work? This collection encapsulates a few of my great loves: Greek Mythology, Ancient Egypt, Varied Religious Iconography. I find religious narratives often condemn the notions of "alternate sexualities," and producing this collection as a queer individual was a gesture of reclamation of these symbols and motifs for my community. My parents met while at university, both studying GARLAP — Greek and Roman Language and Philosophy. At that time, Apartheid in South Africa meant that if one was of color, and wanted to study at UCT, a white only university offering the highest standard of tertiary education, one had to take an elective not offered at the other universities. GARLAP was one of these subjects, and they both did this, adamant to defy the system I like to think, and so met one another while studying mythology at UCT. I think that moment and love — them meeting — is very much present within me. "I have found that accessories can be more gendered by societies than actual garments. Queer accessories defy all of this." You come from a legacy of jewelry makers don't you? Can you tell us more about how your background informs the work that you do now? I do, yes. My Father's grandparents originally came from Kerala, and many practiced as jewelers — traditional metal work, as I understand. My Desi decent really champions most of what I do now, purely because I think there is still not enough public conversation happening in and around Indians in South Africa. I grew up with very few (I don't really think I can remember any) creative Desi role models in my country. South Africa does have an extensive Desi population, so I battle with accepting this fact, as well as the notion of not being an advocate for South Asian and queer South Asian representation in my work. As a local fashionista in Cape Town you believe in the power of adornment. Why is queer style important — and in particular — why are queer accessories important? Queer style is a tangible engagement between ones innermost self or selves, and the outside world beyond our bodies. As a community that is often forced to hide so much inside of ourselves, this gesture of dressing or "style" is one of the most effective ways to communicate who we are and what is inside our hearts. 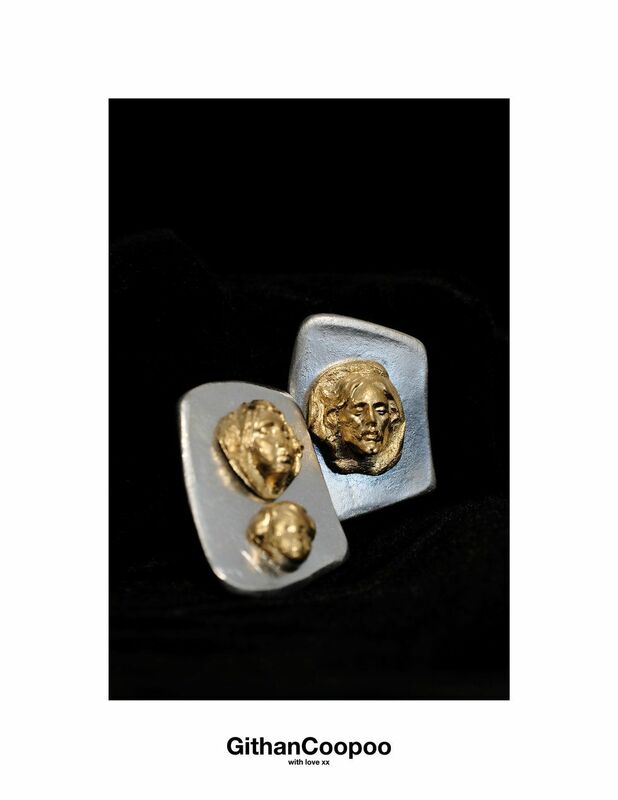 When making my pieces, I hope [they] bring a subtle sense of self-awareness to the wearer. To adorn the body with a fragile ornament is to make a commitment to sensibility and sensitivity — both powerful and beautiful practices. I have found that accessories can be more gendered by societies than actual garments. Queer accessories defy all of this. It is why I chose to shoot the collection on gay and queer men: accessories should be for everyone. Can you tell me more about the design process for this campaign: how did you come up with the concept for this shoot and video? 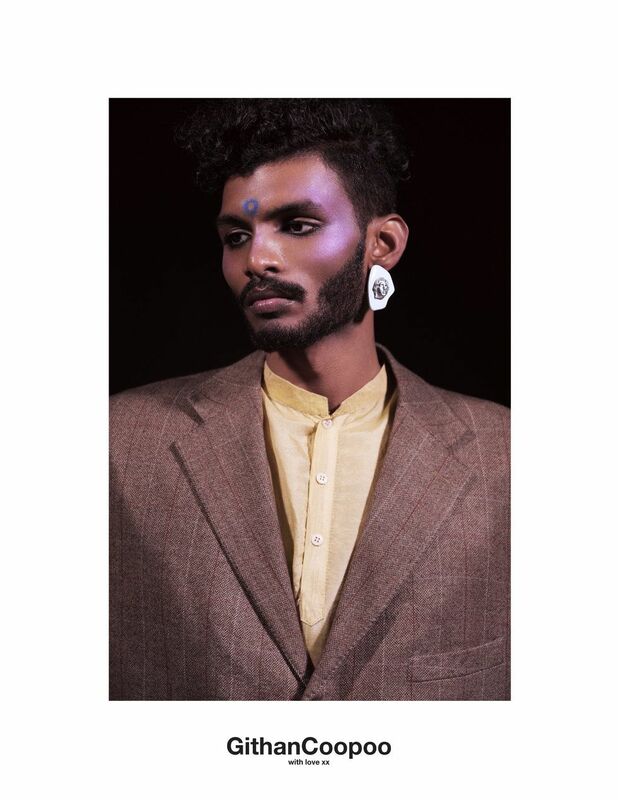 I'm incredibly proud of this campaign and want to just acknowledge the individuals I am so indebted to: Jarred Figgins (Photography, Videography and Post Production), Peter Georgiades (Styling), Gareth Coleman (Make-up), Prabu Davaraj Raman (Muse), Shakil Solanki (Muse) and Rumanie Coopoo (Assistant). The campaign exists as a love letter to the Desi Community in South Africa. Because the subject matter of the collection looked to ancient iconographies, I wanted to explore the notion of the archive in the campaign — specifically viewing the archive through a queer lens and highlighting the countless incidents of erasure that have taken place and still take place today. All the staging and props come from my parents' home; all of the clothes and garments used in the shoot are my father's and come from his personal wardrobe; the final gesture towards this love letter was my decision to be in the actual campaign with Dave and Shakil. I wanted to capture images that resemble traditional photographs from Desi families in South Africa from the '40s and '50s. I was inspired by an Exhibition by South African Artist Jordache Ellapen, who looked at an archive of photographs of an Indian family that lived in Durban. The images were beautiful — so timeless and elegant. The video is the product of Jarred's genius. I really liked that his choice of filming on VHS also referenced the archive so easily. The music is from a favorite album I grew up with, Indian Chants by Ravi Shankar. At the time of shooting, I had met someone who made me fall in love with Carnatic music, and consequently him too. I generally just loved the idea of a video campaign. There was something so cool about the idea of it. The earrings also almost read like products for a '90s TV infomercial which I absolutely love. I grew up watching those. "My practice really speaks to a longing for inclusion and love"
Are these items available for purchase? If so, do you ship internationally? How do people get them? The best way to get a pair would be to send me an email: githanc@gmail.com. Can you speak to the queer scene in Cape Town right now, and how that's informed your own art practice? I am so grateful for the individuals that make up this community in South Africa. They are so inspiring in their ability to transcend and be otherworldly beautiful while doing it. However, I think much of the injustice against this community, but also specifically within this community itself, is the emotional core upon which my collections are based upon. My practice really speaks to a longing for inclusion and love.